Scrapbooking provides you with much more creativity than slipping photos into plastic sheets in regular photo albums. From the scrapbook pages to the page embellishments, you have no boundaries when it comes to creating a unique scrapbook for your photo-captured memories. If you’re a beginner with scrapbooking or want more unique decorations to add to a new scrapbook in your collection, check out our guide for unique scrapbooking supplies. Crafted by indie sellers, this varied selection of scrapbooking items can added to your next scrapbook and be part of your memories. 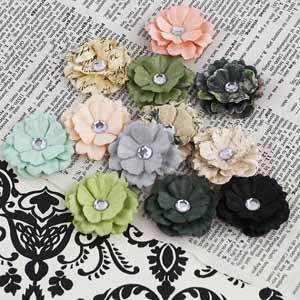 Decorate your scrapbook pages with Jodie Lee Designs’ mulberry paper flowers! Handmade by the Nature Garden Melisse Flowers collection by Prima Marketing, these flowers have various patterns that display whimsical and vintage-like features. Each flower is centered with a large rhinestone. A dozen flowers is included in this listing. Want more decorative scrapbook supplies from Jodie Lee Designs? Check out the shop for a wide selection of scrapbooking items! 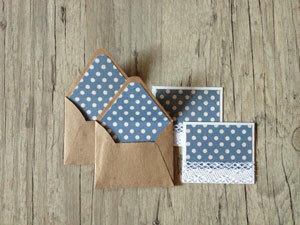 Keep small mementos of your memories in these blue & white polka dot mini envelope set from Inghetta Design! You can glue these envelopes on scrapbook pages and put anything small into these envelopes, such as extra confetti from your child’s first birthday and small coins or money from another country during your travels. Each envelope comes with a matching miniature card, which you can use for other purposes like a personal note card in your child’s lunch box. Find more small envelope sets in various colors and designs in Inghetta Design’s shop. 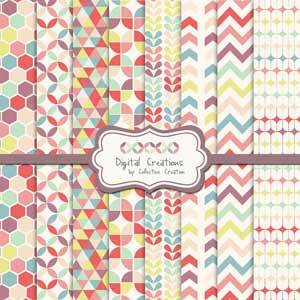 Fill your scrapbook with Collective Creation’s geometric patterned digital paper! Created with pastel-colored shapes from triangles to chevron stripes, these scrapbook pages are decorative and modern, perfect for placing photos of your 21st birthday, newborn baby or you traveling with friends. Since this scrapbook paper set is digital, you can print out as many scrapbook pages as you want to make a full scrapbook album. Collective Creation has many other scrapbook paper sets in different designs and colors, so you can mix and match them with this geometric scrapbook paper set for a colorful and eye-catching scrapbook. Make your scrapbook sweet with Hello Love Too’s sweet shoppe art paper collection! With a gumball machine, cake, candy jaw and candy shoppe awning, this sweet shoppe art collection has all you need to create your own sweet shoppe in your scrapbook. Perfect as decorations for a scrapbook page filled with your little girl, this colorful and girly clip art collection is digital, so you can print it out as much as you want to put on your scrapbook pages. Discover more whimsical and fun clip art collections in Hello Love Too’s shop. Label your pages with names, events and more with Pink Paper Trail’s vintage alphabet postage stamp set! 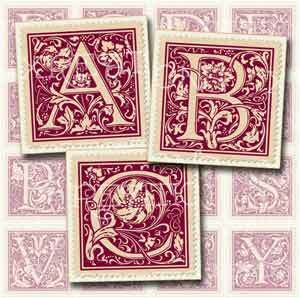 Originally created by Pink Paper Trail, this vintage alphabet postage stamp collection displays intertwining vines around old-school font letters. With its digital nature, this postage stamp paper set gives you the freedom to print it out as many times as you want. 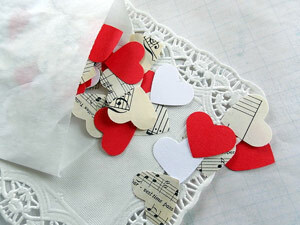 Fill those empty spots on scrapbook pages with Vintage Scrap Shop’s vintage heart confetti mix! Punched out from vintage music sheets and red and white cardstock paper, this collection of confetti hearts can be sprinkled onto scrapbook pages for a whimsical touch. Surround photos of you and your lover with these confetti hearts to show your love through your scrapbook pages. 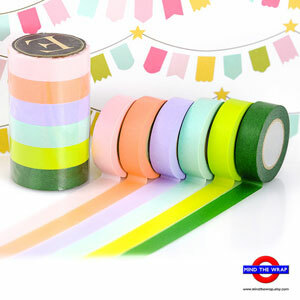 Frame your scrapbook pages with colorful washi tape from Mind The Wrap! This set includes six washi tapes in different, spring-like colors and can be used to add color to plain scrapbook pages. You can also find more washi tape in various colors and designs in Mind The Wrap’s shop to decorate your scrapbook pages with, such as Christmas-themed washi tape for Christmas photos. Dot your scrapbook with pearly rhinestones from Bling Deco! 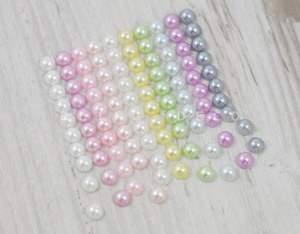 From white to light green, these pastel-colored faux pearl rhinestones can be used to frame photos, decorate empty spots in pages and more. You can find more decorative elements to use for your scrapbook albums in Bling Deco’s shop! Surround photos of you, your family and friends at the beach with Brown Pigeon’s beach-themed rubber stamp set! 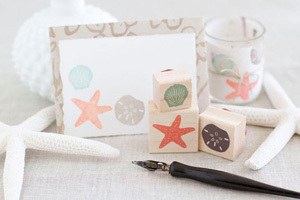 This set includes a starfish, fan seashell and sand dollar stamp, which you can use interchangeably on all scrapbook pages. Find the perfect ink pads to go with these stamps here in Brown Pigeon’s shop. 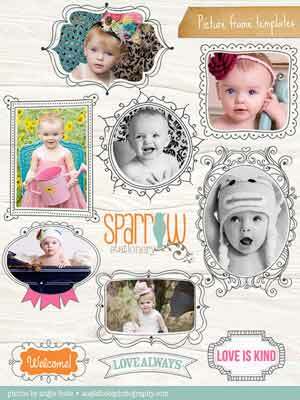 Frame your photos with Sparrow Stationery’s digital frames set! Hand-drawn with various, quirky and elegant designs, these frames are great tools to use to organize your photos. This set includes seven frames and three text banners that are completely customizable. 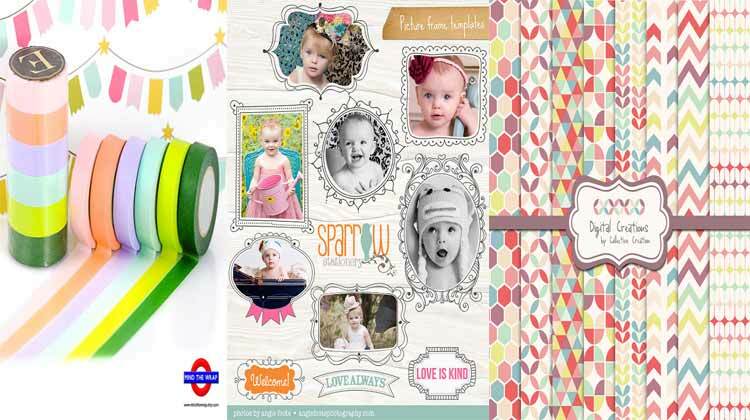 Find more scrapbook items, such as frames and templates, in Sparrow Stationery’s shop. Scrapbooking is a wonderful craft to participate in not only because you can decorate your memories with colorful embellishments, but also so that you can have a safe place to keep your cherished photos. If you’re planning to add scrapbooking into your life, one aspect to include to ensure you have great scrapbooks is to keep a journal of memories with you. By carrying a journal with you, you can jot down all sorts of memories that you can add to your scrapbook. You can even use journal entries in your scrapbook by cutting off the extra, blank spaces around the entry and gluing it next to photos or on scrapbook pages. Some fantastic journals from indie sellers include: Our Little Messes’ personalized journal; Beauty Bound Books’ personalized marble-patterned, leather journals; and Alexis Mattox Design’s modern, chalkboard-inspired journal. Whether you’re making a scrapbook for a friend or for yourself, finding the perfect scrapbook supplies is always a rewarding adventure as you watch your scrapbook come together. Happy scrapbooking!